I just tried the special Sasha 15 radio call and received the following. 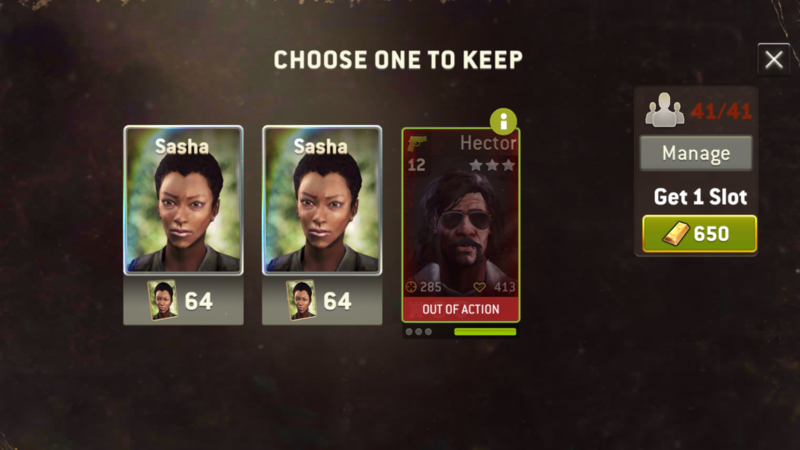 Needless to say, I chose the Sasha tokens. My guess is the devs are preventing you from getting a Survivor via a radio call and being able to plug them into The Distance right away. There used to be a strategy of calling these scrubs and slapping some wrestler armor on them and feeding them to the walkers (which resulted in an insta-kill if the wrestler trait kicked in). I assume this was put in to stop that and it is still in effect even though the wrestler gear strategy was nerfed a while back. @Kaz, can you confirm this is correct? This appears to be another glitch associated with going from playing the distance to another mode. 1) Assult visual effects appear at hunter. 2) Only able to take two survivors into OP raid. My best suggestion is when changing from playing the distance to another mode, including making calls is to shut app and restart first.